This month, our featured guest is Joshua Holko. We want to express our thanks to Joshua for taking the time to answer our questions, and to share some of his work and experiences with us! Please visit his site links to see more of his wonderful work, and to let him know you enjoyed this interview. :: How did you get your beginning in photography? I can lay the blame, or credit, for my beginnings in photography squarely at my father's feet. When I was about ten years old, my father was pursuing a non-commercial interest in medium and large format fine art photography. He was running a successful marketing business, studying and pursuing photography part time. He had a small well-equipped dark room, a Bronica medium format camera (we are obviously talking pre-digital) and a Canon 35mm SLR. He purchased my first ever camera, which was a Kodak Disc camera. A format that thankfully had a very short life as the negative was tiny and the image quality woeful; but it was enough to get me hooked. Over the years as I grew older, my interest in photography waxed and waned but never went away. In my late teens I began my formal education in photography, and as I have gotten older, the passion has continually increased and now it's a driving force in my life. 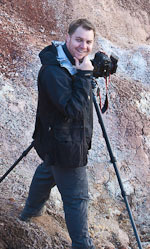 :: There's a growing number of photographers who are "self taught" rather than choosing a formal photography education. You have studied photography at the college level; how has your formal education helped you in your development as a photographer? Principally, a formal education provides a solid foundation of not only technical skills but also a basis in the history of photography and art. Probably one of the most important and over looked aspects a formal education in photography can bring is assistance in the development of an individual photographic style. With so many photographers producing work these days, the importance of one's own style to differentiate your work is critical in marketing. Another overlooked aspect is the critical feedback you receive on your photography during the education. This feedback can really help with the development of your photography and the education process is a great place to receive constructive feedback and a wonderful venue for learning just what makes a good photograph. Nowadays there seems to be a whole generation of new photographers that shoot principally for the Internet without ever getting involved in printing. Photography is all about the print and a formal education helps in developing print making skills and understanding just what makes a good print. :: Has it always been landscape photography for you? 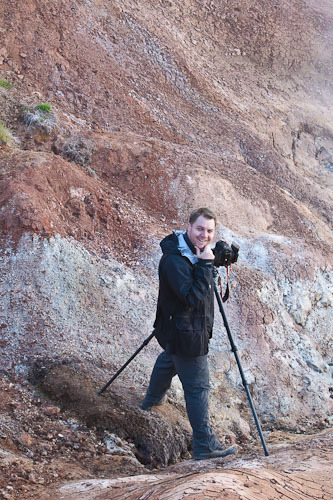 Over the years I have photographed weddings, corporate portraits, commercial work and even a little rock climbing, but landscape and nature photography have always been my real passion. Nowadays I don't shoot weddings and will only take on portrait and commercial work if it suits me. There are many fine photographers who specialize in weddings and portraits and I prefer to let them do what they do and I can get on with doing what I love doing. It doesn't always pay the bills as well, but at least I am doing what I love and am passionate about and that's important to me. I strongly believe that we all do our best work when it's driven by passion. :: What was the best piece of advice you've received from another photographer, and why was it so important? I have always liked the comment, "Success Happens when Opportunity Meets Preparation." It's a great reminder to me to plan well to create opportunities, which hopefully leads to success. I was listening to a podcast by Brooks Jensen, the editor of the very fine Black and White magazine, Lens Work, a couple of years ago, and he was talking about something he called "10,000 hours." 10,000 hours is the amount of time you need to spend to get really good at something. If you want to be a master printer, then you need to spend 10,000 hours making prints and learning the craft. If I recall correctly, Ansel Adams once said, "You can't make a good photograph until you have made 10,000 negatives." I have never forgotten that. Whether you are learning a musical instrument or making prints, it takes a lot of practice to get really good at it. Practice makes perfect and in order to be a good photographer you need to do a lot of photography. :: What is the best piece of non-photographic gear in your collection that you can't live without, and why? Probably my 66° North Glymur jacket, which I picked up when I was in Iceland last year. It's the best outdoor jacket I have ever owned and I am a real fan of their clothing. I just wish it was more affordable to purchase in Australia. I am always looking for the edges of weather in my landscape photography, as that is where the best and most interesting light usually occurs. It also means I am frequently caught in rain, snow and inclement weather, so a high quality water and wind proof jacket is essential. :: What is your philosophy when it comes to post-processing? I get asked this question quite a lot. My philosophy is very simple: I don't do HDR and I don't do composite photographs or any kid of heavy handed digital manipulation. All of my photography is captured from single frame exposures in the field. The only exception to this is where I have stitched images together for a panoramic, which I only rarely do. I make basic adjustments to my RAW files, including white and black points, tone curve adjustments, sharpening, etc., but avoid heavy handed pixel level manipulation. I like to try and get it all in the field, which is why I use graduated neutral density filters most of the time. :: Out of the locations in your neck of the woods, which has been your favorite, New Zealand, Tasmania or Australia? All of the above have something very different to offer, but I would have to say New Zealand's South Island is my personal favorite. It's tailor made for the sort of landscape and wilderness photography I like to do, with everything from majestic mountains to wild west coast beaches. 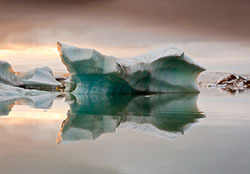 Out of the three locations it is the only one that has my favorite photographic subjects: icebergs and glaciers. Glaciers and icebergs are in short supply here in Australia.   The Australian mainland (and to some degree, Tasmania) can be quite problematic for landscape photography. The best light is fleeting and a few moments either side of sunrise and sunset the light is often quite harsh and unflattering. I definitely prefer countries in the far north and south where the sun is at more of an oblique angle for longer periods of time. :: You're planning a big trip to Antarctica. What logistics were involved with planning a trip of this magnitude? Yes, I am leaving for Antarctica in late November this year  for three weeks. International photography is proving logistically more difficult every year because of the restrictions imposed by airlines and airline security - not to mention time delays because of natural events such as volcanic ash (sorry I couldn't resist adding this one as I am currently sitting at Melbourne Airport trying to get a flight to New Zealand. My morning flight was cancelled due to volcanic ash). It's three plane rides and two days by boat for me to get to Antarctica. Melbourne to Sydney, Sydney to Beunos Aires, Buenos Aires to Ushuaia, and then two days sailing. That's a lot of travel and a lot of time spent on the move, so planning is critical. Experience has shown me its important to allow enough time for possible unforeseen delays as well as time to physically and mentally recover so as not to arrive at the final destination exhausted. In this case, I will be spending a few days in both Buenos Aires and Ushuaia to ensure I am fully recovered and ready for long hours of photography under what I hope will be amazing Antarctic light. The added benefit of a few lay overs is time to soak up some local culture, food, etc. In some ways Antarctica is logistically less complicated than destinations like Iceland, since you have to go with some sort of organized group to get there. You can't just get up one morning and decide to go to Antarctica on your own. A lot of the general logistical issues are therefore handled by the trip guide or tour operator; which is great as it frees me up to focus on my photography. The trick becomes choosing a group that is as small as possible that is going to focus on photography to the same intensity that I am. When I travel, my photography is all encompasing and everything else takes a back seat - including sleep. In this case, I chose a small group of dedicated photographers, including some internationally well-known names, as I felt this would give me the best possible opportunities. :: You've spent some time in Iceland as well. What were some of the difficulties you faced while trying to photograph that country? Was there any aspect of that trip that caught you off guard? 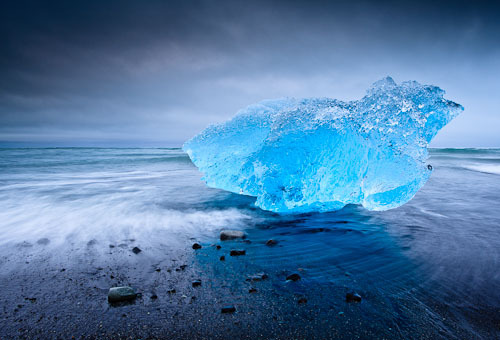 Iceland is a long way from Australia and logistically it is quite difficult to get there with all of the photographic equipment I like to travel with (I just don't like to leave anything at home incase I find myself in a situation where I might need it). In many ways my travel style flies in the face of the popular "travel light" ideology. I know a lot of photographers who will pack a couple of zoom lenses and a light weight tripod and be done with it. At the other extreme I like to take a full bag of prime lenses, my main large gitzo tripod and all the accessories I can manage including a full size 17" laptop, back up drives, back up cameras, etc. I planned extensively for my Iceland trip, even purchasing an additional seat on the flight from Heathrow to Iceland for my camera equipment. I try to be as organized as possible when photographing away from home. That means I like to have car hire organized, a guide if needed, food, etc., all pre-arranged so that I can hit the ground running and concentrate solely on my photography. Trying to arrange car hire in Iceland and co-ordinate where to get food and petrol, where to shoot and when to get the best possible light, is no easy feat. It is critically important to know where you want to shoot and what time the best light is likely to be to give yourself the best possible opportunities. Nothing really caught me off guard when I was in Iceland last year, although it did take me a while to get over the sticker shock of 4-wheel drive car hire in the Iceland summer. It is unbelievably expensive. And you need a 4-wheel drive in Iceland since so many of the great locations are in the middle of the wilderness. :: Other than Antarctica, have you started to plan your next adventure? Yes, most definitely. I leave for Antarctica in November/December, and I will be spending some more time in Tasmania for the opening of my new exhibition, "Colours of Iceland," in December . I am headed to France and Italy in July next year and then back onto Iceland in late July early August 2012 to visit the Snaefellsnes Peninsula region, as well as returning to a couple of my favorite locations I have visited previously. I also have very tentative plans in mind for more trips to New Zealand and Tasmania in 2012 and also to Spitzbergen and Greenland. :: What has been the scariest or worst day you've had photographing in the field? What actually scares me most is not being able to get the shot I want when I have invested thousands of dollars and travelled half way around the world to get it. Since most of the photography I do involves extensive travel (often into remote parts of the wilderness) much depends on the weather and available light when I finally get there. Time is always limited at these remote locations and my fear is always I won't get the light I want or something will otherwise go wrong that might prevent me from getting the photograph. I did have quite an adventure when I was in Iceland last year chasing one particular photograph. 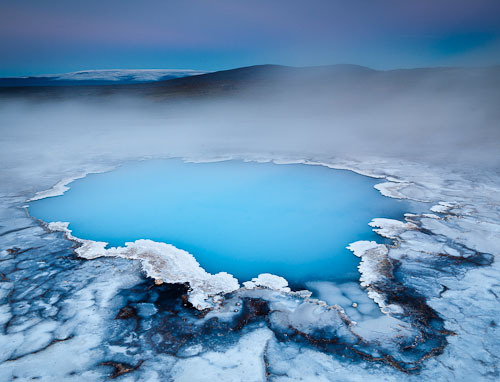 I wanted to visit a deep blue geothermal pool in a very remote part of central Iceland known as Hveravellir. The road into this part of Iceland is the worst I have ever experienced; in fact I wouldn't even classify it as a road. It's 70 odd miles of rocky wilderness track that is capable of breaking pretty much any vehicle of the non-military variety. The track itself is sprinkled with rocks the size of soccer balls, blind corners and big drops, as well as river crossings and fords. It winds its way haphazardly through a very barren and remote part of the country. The drive into Hveravellir was bad enough during the day, but I was unprepared for what the drive out would be like. I arrived at the location I wanted to photograph about half an hour before sunset (by which time I was just about ready for the Chiropractor). I set-up my camera and was fortunate enough to get some stunning light in combination with rising sulphur from the surface of the pool. This was one of those rare occasions when I actually came away with the photograph I had pre-conceived in my mind's eye - a photograph I titled, "Well of Life." It was one of the finalist images in the world 2011 Extreme Environment photographic competition and that won a silver award at the recent APPA awards (my other finalist photograph, "Blue Berg," won the People's Choice Award and GOLD at APPAs). In my experience, the preconception is often stronger than the reality, and it is a rare occurrence when reality matches or exceeds the expectation. The problem was, a thick fog had descended and blanketed the entire area reducing visibility to around 10 feet. Coupled with that, the temperature had plummeted and it was freezing. I crawled for more than 4 hours, almost totally blind in near zero visibility along the worst road of my life with my Jeep's suspension sounding like it was falling apart and dropping bits along the way - the check engine light was on and I was running out of fuel. I don't think my rental Jeep will ever be the same. Without my GPS I would have lost the track for sure and no doubt ended up broken down in a ditch and stranded in the middle of the Iceland wilderness. I ended up making it back to Gullfoss in time to grab an hour's nap in the car before sunrise. I can laugh about it now, but it was actually quite scary at the time. It was definitely worth the effort, as I was rewarded with wonderful dawn light at Gullfoss. I often wonder how far I will go in the pursuit of my photography - I don't think I have found my limit yet. :: What challenges you the most in photography now, as opposed to when you started? What challenges are you concerned with for the future of the medium? One of the great things about the digital photography revolution has been the instant feedback that you receive in the field via the camera's LCD histogram. This frees up the photographer to focus on composition. Back when I was shooting chrome slide film (primarily Fujichrome Provia 100 and Velvia 50) the challenge was always to first make sure the exposure was correct, since there was so little latitude with chrome films. Composition was part of the equation but always seemed to be playing 2nd fiddle to exposure. Nowadays the instant feedback means I know straight away if I have the correct exposure, and that's great. I can focus on composition almost exclusively nowadays and the new challenge is coming up with new and unique compositions of often over photographed subjects or locations. My primary concern for the future of the medium is the "print." There is no substitute for holding or viewing a beautifully crafted and printed photograph. I fear that the Internet may be stifling the print craft with so many photographers shooting solely for the web these days and I am very grateful for organisations such as the AIPP Australian Institute of Professional Photography and their APPA Australian Professional Photography Awards that focus on the craft and beauty of the fine art print. I had several people approach me at my recent exhibition and all of them commented that it was a real eye opener to see the fine art prints vs. the small online jpegs of the Internet. :: Walk us through how you go about setting up a shoot? I like to arrive at my shooting location well ahead of what I think will be the best light of the day. Almost all of my photography is done during the magic hour of sunrise and sunset, so this inevitably means rising well before dawn or arriving well ahead of sunset. I like to "work" an area, trying different compositions, different focal lengths, etc., whilst I wait for the light to change and hopefully improve. I will start with what first grabs my attention compositionally and then continue to refine the frame as I take more exposures. I shoot a lot and its not uncommon for me to shoot 30 or more frames of a single scene and then choose the individual frame I prefer during editing. My photographs tend be quite structured in their composition; and I am always looking for balance in my photographs. It's just the way I see. :: How much pre-planning goes into a shoot, or do you pick the location and then let the area dictate what and how you photograph the scene? I have heard it said that there are hunters and fishermen in landscape and nature photography. Hunters tend to go from location to location looking for subject and light. Fishermen tend to stake out a location and wait for the right light. I tend to have a foot in both camps, depending on how I am feeling and the prevailing conditions. I try and do as much pre-planning as I possibly can, starting with the general location I plan to shoot. I like to know where I am going and what it is I am planning to shoot. Once there, I will adapt and go with my instinct and light. I try to let the subject dictate the frame and keep my eye on the light. So much of landscape photography is about the quality of the light. I will let the quality of the light drive my photographs as much as possible. :: I understand you've recently become a Moab Master? Yes, in early August  I was appointed as the First and Only Australian Moab Master Photographer and Printer by Legion Paper and Moab. The Moab Masters Page is here! :: What is your favorite image in your collection? That's a tough question for me. I think as photographers we need to be our own harshest critics. Choosing a single favorite is difficult; but I definitely have a soft spot for the Well of Life photograph from Hveravellir in Iceland. :: What piece of advice would you pass on to someone just getting started in photography? Be passionate about your photographic subject. It doesn't matter what you choose to photograph, but if you are passionate about it, you will produce your best work.